Hydroelectric dams in Malaysia provide power for much of the country. Many of these impressive structures were built along the Perak River in the north. The seamless TRITOflex rubber membrane was installed at a plant dealing with disruptive leaks for years. 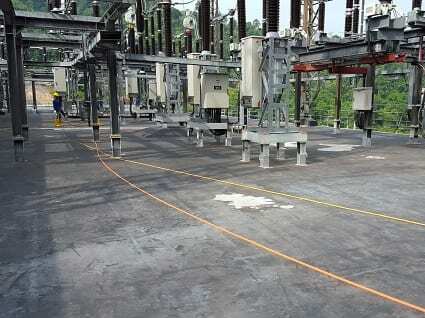 The private electrical company, Tenaga Nasional Bhd, decided to have TRITOflex installed at this remote location after learning about the long-term benefits it provides compared to other coatings and liquid membranes available in the Southeast Asian market. Some of these coatings had already been used on this roof with only a few years of performance. • Excellent adhesion to the existing concrete and the existing fiberglass emulsion coating on some ares of the roof. • Non-slip, durable surface that is safe for plant workers to walk on and strong to resist the monkeys which play on the roof at night. 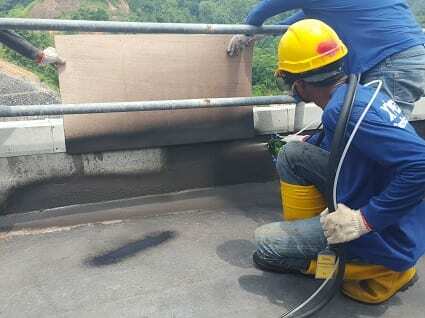 The water-based TRITOflex rubber was installed by RNC Integral Technology of Malaysia to a 1.5 mm dry (60 mils) thickness in one coat over 1,800 m2 (19,000 sf) of area; seamlessly flashing around the multitude of penetrations on the roof which would be difficult to seal with traditional sheets or other liquid products. Unlike some liquids, there is no restriction on surface temperature, so installation in the extremely hot and humid rain forest climate posed no problems during the project. The hydroelectric plant’s roof, which protects multiple giant turbines to generate power from the river, is now watertight with the long-term, premium TRITOflex solution!